The simplest way of describing the value Monit is that it is a powerful monitoring tool, which can take action in the event of failures or alerts. Monit is able to keep an eye on processes, files (size, permissions, checksum), the system (CPU, RAM, Load), as well as protocols (HTTP, FTP, SMTP, SSH, etc). If any of the monitored items change in specific ways, Monit can spring into action with an alert, run separate programs, or attempt to correct the problem with a prescribed action (e.g. restart a service). How do I install Monit? How do I configure Monit? After Monit has been installed, all configuration changes can be made via the monitrc file via text editor, in this case I’m using vi. Note that all of the paths for pid files and other items in my examples are for Ubuntu – you may need to do some edits if you are on a different version of Linux. Once the file has been loaded in the text editor, you will see that there are already a number of options set (e.g. 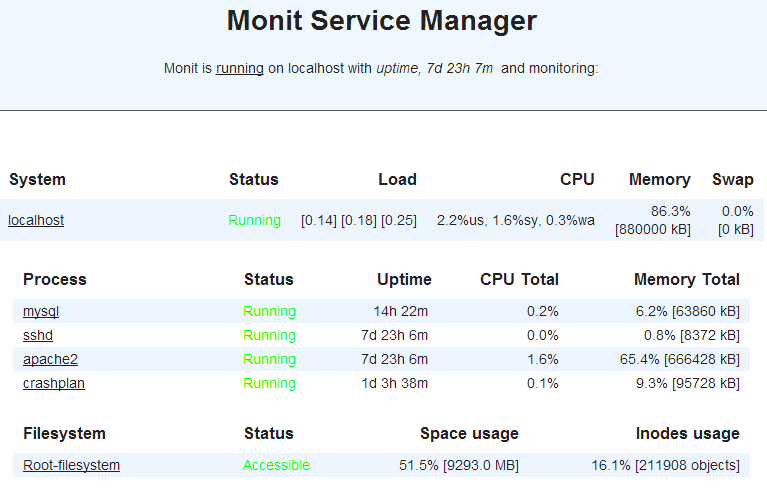 Monit is set to check every 2 minutes by default) in addition to a number of items which are commented out. For this example I’m not changing any of the default values, and you can move to the bottom of the file and begin adding new entries to be monitored by Monit. First I will configure Monit to use a the local system as the default email server, set the format of the alert/status emails to be delivered, and the email address I want email alerts to go to. If you are able to, it is best to setup an alias email address to use for monitoring (e.g. monitoring@yourdomain.com), that way you can easily add additional rules or filters for your email based on the email address. Monit has a nice web interface included, but is disabled by default. One important thing to note – the web interface allows the user to start, stop, and restart monitored services, as well as make monitoring changes. As such, I highly recommend using an extremely long and complex password in addition to a non standard user name for the account specified in this step to enable the web interface (format: allow accountname:password). It may also be in your best interest to limit the port used (2812 in this example) via firewall to your own IP address. Monit has the ability to monitor disk usage for a system, in addition to specific files. In this case, the monitor has been configured to watch the free space available on the /dev/vda drive, and send an alert if it is 95% full. The group tag seen in this example is used to organize different monitors, it doesn’t impact the usage in any way. Monit can also monitor the host system’s load – in this case sending an alert if the load average over the course of 5 minutes is larger than 3. In this example, Monit is monitoring MySQL in two different ways. The first way is via the specified pid file – Monit is reading that file, determining the process id, and then keeping an eye on that process on the system. The second way is via service testing – Monit is checking that MySQL has port 3306 open with the mysql specific protocol (it supports a number of options). If the process fails either of those monitoring checks, then the stop & start program scripts are run, restarting MySQL. In this example Monit is checking the SSH daemon via pid and SSH protocol service response. In this example, the Apache web server is being checked four different ways. The first two have already been shown in previous examples, monitoring via pid and service protocol (in this case http). However, just because the Apache webserver is running doesn’t mean it is properly serving files. In this example, Monit is asking for a specific URL, “/monit/token” from the web server to verify it is able to serve static content. Monit is also keeping an eye of the cpu usage of this process – it is alerting when CPU usage is high, but it could also restart the service on extended CPU usage if desired. check process crashplan with pidfile /usr/local/crashplan/CrashPlanEngine.pid group backup start program = "/etc/init.d/crashplan start" with timeout 60 seconds stop program = "/etc/init.d/crashplan stop"
stop program = "/etc/init.d/crashplan stop"
Hopefully this introduction is enough to get your creative monitoring juices flowing. There are lots of other examples for monitoring different things using Monit, and the platform is flexible enough that it can almost do anything you need.